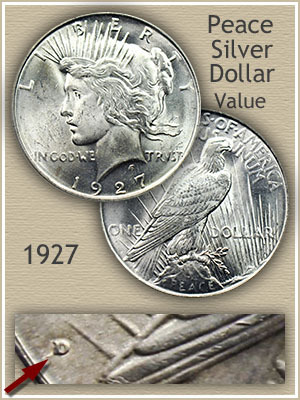 Minimum 1927 Peace silver dollar value is $24.31 currently. However a couple of factors are needed to accurately find its maximum worth. 1)	Presence of either the "S" or "D" mintmark does lead to higher value, especially if your coin is in above average condition. Using the images and description below the value chart, finding the mintmark is easy to confirm. Above average condition, leads to the second major factor. 2)	Judging the condition of your silver dollar is more involved but worth taking a little time to determine. The greater amount of detail that remains on the surface, the closer to collectability status is your coin. Evident on the chart, 1927 Peace silver dollar value jumps considerably if in remarkable preservation. View the coin pictured, absent are any signs of wear and original bright luster remains. With the "S" mintmark on the reverse this Peace dollar is recognized by collectors as a scare combination of condition, date and mintmark. With the help of the "grading" images below, recognizing the visual differences in the quality of silver dollars becomes obvious. A complete assessment of value includes identifying the mint that produced your silver dollar. In 1927 the mints in Philadelphia, Denver, and San Francisco struck Peace dollars. On the reverse, two of the mints added small mintmarks, "D" to identify Denver and "S" San Francisco. If no mintmark is present, Philadelphia struck the coin. Because of mintmarks small size, and sometimes faint impression, I always use a magnifying glass. Rarely does a silver dollar survive in original pristine condition as first minted. They were minted in bulk, stored in bags of 1000, transported in bulk and the inevitable contact with each other left many marks on the coins. Most 1927 Peace silver dollars were heavily abraded even before entering the harsh environment of circulation. Pictured is a rare lucky survivor that managed to avoid the adverse treatment of coins meant for use in commerce. Even from a distance this coin radiates original brilliance of the day it was minted. Upon close-up the stunning luster is not interrupted by any prominent nicks or abrasions. Truly a remarkable Peace dollar of rare quality and in great demand by collectors. Featured in a David Lawrence Rare Coin Auction, Peace dollars collectors saw the opportunity to add a truly rare condition coin to their collection. Final price, $6400. High quality examples of any US coin are avidly collected. Starting with the image of an "uncirculated" Peace dollar, compare your coin to the grading images to find a close match. Wear from circulation flattens and removes details from the surface. The visual difference separates one "grade" from the next. Although top values are reserved for the "Uncirculated" grade, a lightly worn 1927 Peace dollar is still highly valued by collectors. 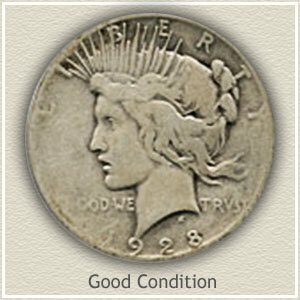 Uncirculated: 1927 Peace silver dollar value and collector appeal rises well above its base metal price in this grade. 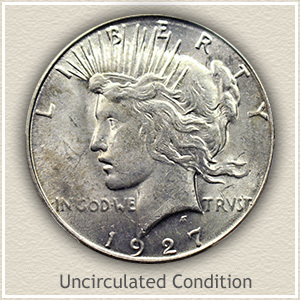 The technical standard is no wear to the surface to reach "uncirculated" condition. Mint luster, a radiating shine, must remain complete across the coin. It is easiest so see when viewed under a light, and tilting the coin side to side. Liberty's cheek, a high point of design, is quick to loose luster from wear causing a dull grey appearance. 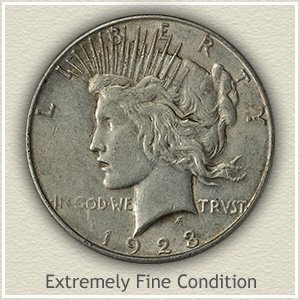 Extremely Fine: 1927 silver dollars in "extremely fine" condition begin to enjoy a premium value. Only very light wear is acceptable for this grade and limited to the very highest parts of the design. Examine closely Liberty's hair, a distinct fullness with rounded features must remain. The tie of hair at the back is still bold with only minimal merging of detail. On the reverse, all feathers must be separated although some flatness is becoming obvious. 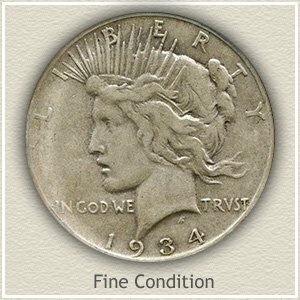 Fine: Moderate wear leaving areas with a flattened appearance is typical of a Peace dollar in "fine" condition. Noticeable is the leveling of a once rounded cheek and neckline of Miss Liberty. A smoothness and flatting of hair flowing behind the neck is a good indication of this grade. Good: Lack of detail over large areas, defines the "good" grade. Once well-defined strands of hair are now missing, once rounded features of Liberty's cheek are flattened, leaving an overall smooth and worn appearance. 1927 Peace silver dollar value in this condition is supported by the bullion metals market, however mint marked examples have broken above this minimum. All old US coin values. Using value charts in combination with grading images to judge condition discovers how much your old coins are worth. Get the best price if selling by knowing the accurate value of all your coins. With today's collector admiring these large silver coins, Peace Dollar values are very strong. All have a minimum value of $17.87 with many rare date and mintmark combinations far exceeding the base silver value. Determine how much your old Peace dollars are worth. In demand by dealers. These old silver Peace dollars are very liquid in the coin collecting market. There are always buyers interested in purchasing your coins. Receive the highest price by separating the collectable from the bullion priced pieces. For more info see the Sell Silver Coins article.